On today’s episode of the Journeywomen podcast, I’m doing something I’ve never done in the history of Journeywomen. I’m chatting with two guests at once! Today we have the pleasure of hearing from Holly Mackle and Caroline Saunders on the topic of humor and the gospel! Y'all, there are some episodes of Journeywomen that stand out to me, simply because they feel like a pep talk from your high school soccer coach before a big game, or something along those lines. This episode is one that really struck my heart in ways that I hope I’ll remember for a really long time. 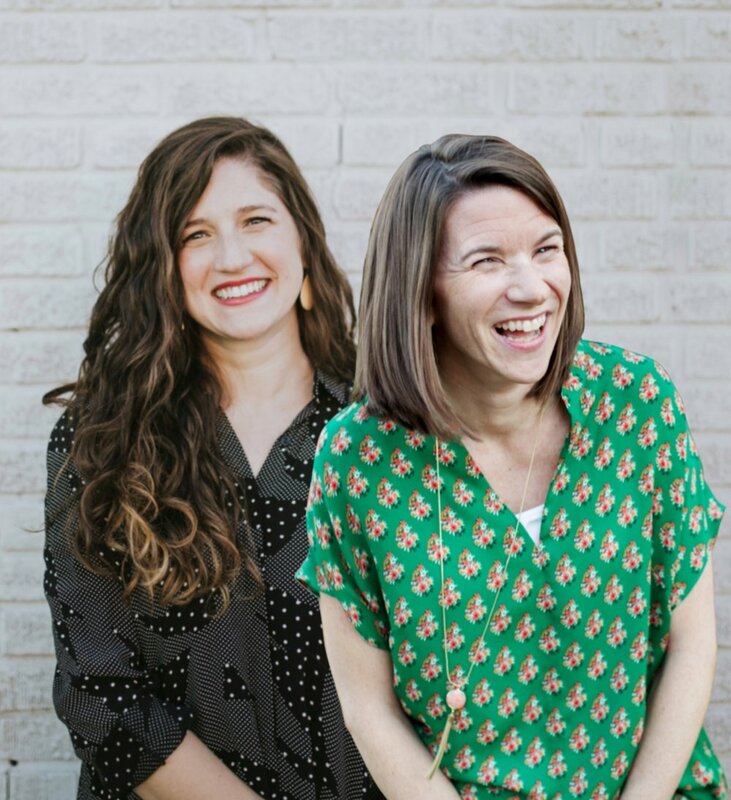 In it, Holly, Caroline and I talked about everything from the Biblical backing for humor and how it relates to the gospel, to practical encouragement for those of us, like myself, who tend to take ourselves a liiiiiitttttle too seriously. So you’ll know them a little better, Holly is the curator for the mom humor collaboration entitled Same Here, Sisterfriend which Caroline also contributed to. They’re both hilarious and I can assure you that you’ll want to be best friends by the end of this conversation. Can you tell us a little about who you are and what you do? How did you two meet? Is being funny something that comes naturally to you guys? Where does it come from? What gives us the capacity to laugh? What's the biblical backing for humor? How does it relate to the gospel? What are some ways we can use being funny to set the scene/tone for welcoming others in as Christ has welcomed us? What's your encouragement to those of us who tend to take ourselves too seriously? On the flip-side, do you have any words of caution when it comes humor? When does humor become sinful? If you could give an overarching goal of humor, what would it be? What would it look like to be a joyful, holy, seriously-happy kind of God-centered, Christ-exalting, Bible-saturated person so that, out of the abundance of the heart, the mouth laughs? Who else has tried FabFitFun? A few of my friends here were raving about it, and I was super curious myself. If you don't already know about FabFitFun, it’s a seasonal box with full size beauty, fitness and lifestyle products. Their Fall Box is awesome! It has products like a vegan leather Vince Camuto Tote, a teapot or coffee press, GLAMGLOW bubble masks, a beautyblender, and that’s just the beginning of it. It retails for $49.99 but always has a value over $200. Don't miss out because they sell out fast. Check out www.FabFitFun.com and use the code JOURNEY to save $10 off your first box, making it only $39.99. I think this would make an excellent gift for a friend, mother-in-love, or let’s be honest, just a fun way to treat-yo-self! Go get it, y'all! Have you had a chance to sign up the free 2-week trial PrepDish is offering Journeywomen listeners? If not, now is the time, my friends! Prep Dish is a healthy subscription-based meal planning service, that I am sure you will all love! It totally simplifies eating healthy whether you’re a student, working professional, or a mom. When you sign up you’ll receive an email every week with a grocery list and instructions for prepping your meals ahead of time. All you have to do is spend 1-3 hours of prepping on the weekend, and all of your meals will be ready for the entire week! Sounds like a great opportunity to catch up on Journeywomen while doing something productive. With schools starting, summer ending, fall beginning, Prep Dish will be such a time-saver in the midst of all of these transitions. Y'all, I am a huge fan of PrepDish and hope you will all try out this free 2-week trial they are offering! All you have to do is go to PrepDish.com/journey.